So, I'm a bit of a sentimental pack rat. There's a closet in my basement that has at least three shoeboxes filled with correspondence I've received over the years -- everything from birthday cards to notes I passed in class in high school. I've also saved copies of articles I've written, magazines I've edited and pages I've designed, dating back to my high school newspaper (you know because I'm sure during my next job interview I'll be busting out copies of The Purple Tide's controversial underwear issue* circa 2000 as part of my portfolio). My personal archives also include a file box of schoolwork from elementary school -- mostly art projects and writing assignments my past self saved in an attempt to amuse my future self. As it turns out, little Susie** Haller was on to something. 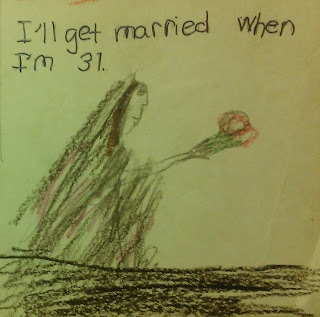 I thought it'd be fun to revisit my creative past recently (OK, I was actually just looking for easy blog fodder) and I came across a collection of stories and poems I wrote when I was in fourth grade. So yes, as evidenced by the green pants, green shirt and green handkerchief in my hair, young Susie loved green as much as grown-up Sue does (just ask my green purse, phone cover, brand new yoga mat, sofa slipcovers, and various articles of clothing). Also, young Susie's hair demonstrates the start of a long history of resistance taming. 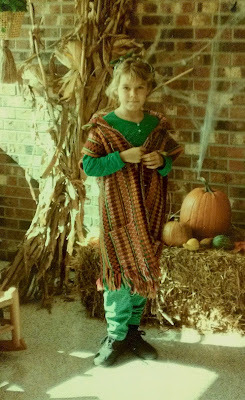 And finally, the elephant in the room, why was I wearing such a festive poncho/cloak/vest? As I recall, the photo was taken on some sort of cultural awareness day. 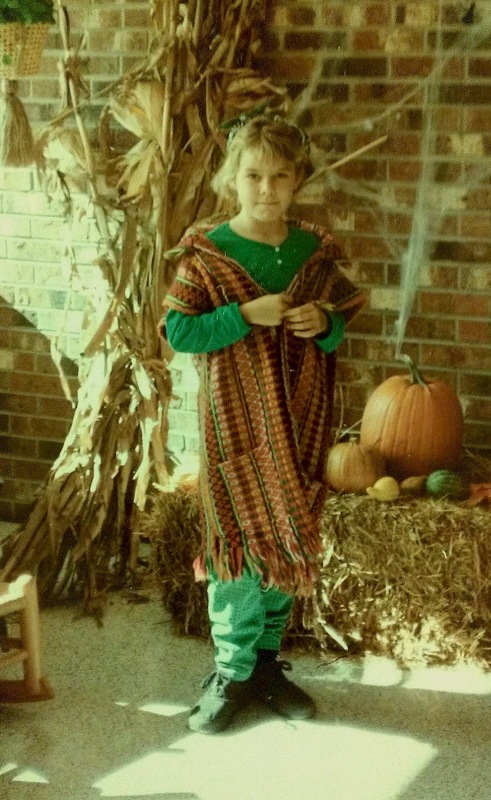 I think the poncho/cloak/vest was my grandmother's ... or maybe it was one of my sister's? Either way it was culturally significant. Look! I even drew myself in green PJs! I know what you're thinking. How was it that with such early promise I did not pursue a career in art? It's a shame it's about to be beamed up. 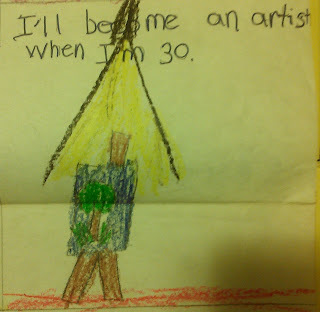 Now, I realize that a fourth grader whose career goal is to be an artist isn't very original or unusual. It probably ranks up there with veterinarian (my other career choice for years and years), astronaut, firefighter or ballerina. But it got me to thinking about being a kid and why we selected the jobs we did when we were little. It wasn't because they were practical or financially responsible, it's because we thought they'd be fun to do. And what person doesn't want to make a living doing something they love? Of course, the older we become, the louder the outside world gets -- drowning out the little voices of the person we were. The artist. The astronaut. The firefighter. The ballerina. I don't think that's to say that the majority of us who don't pursue our fourth-grade career goals are not having fun. I'm not an artist, but I've been able to make a part of my living writing, which is rewarding on so many levels. But I do think we should all try to remember what it was we loved doing as a kid -- what brought you joy or fascinated you? What did you think you were the best at? What could you spend hours and hours doing and not get bored? Those are the things we should all do from time to time to reconnect with our inner-child. I think the contentment we find there can be contagious. As far as the rest of my little timeline, well, I wasn't far off the mark. 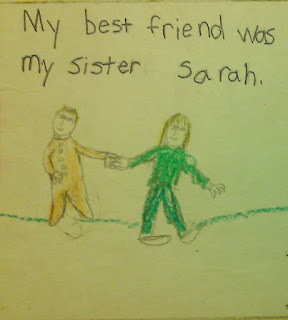 Sarah is the one wearing green. 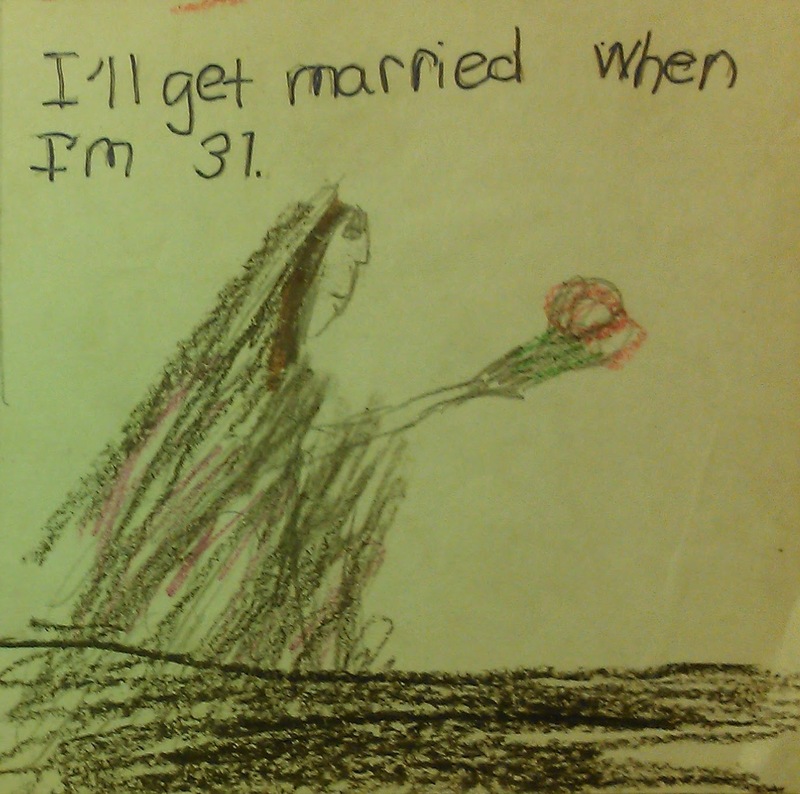 I did not, however, look like Miss Havisham. * We did a centerspread on underwear trends including a sidebar on this history of undergarments. Grownup me is cringing. ** That's right, long before I was "mom," "Sue" or "Susan" I was "Susie," a shy, soft,*** shaggy-headed kid with big dreams and bad pants. *** My childhood word for "fat"